We wrote the book because we believe that personal writing is very potent both for the writer and the reader, because some of the greatest literature is rooted in personal material. Myra Schneider in an interview HERE. 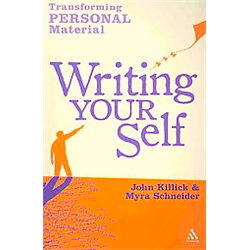 The subtitle of this book about personal writing is “transforming personal material.” I think it is implicitly also about personal transformation. It always seems to me that writing and reading about life is a healing activity, a way to live hugely, and a way to empower ourselves and others. If we can do it well enough to engage others, whether our purpose is to leave a record behind for family, to set the record straight, or simply to share and entertain, the experience is rewarding. I very much can see the use of this book by individuals training themselves and by teachers of adult learners who wish to write memoir, poetry, fiction, or creative non-fiction. It would be useful in hospital therapeutic writing programs or in writing programs for active seniors. You may have memories which you want to plunge into or you may have material like a diary or letters which summon them up. There are other ways though of triggering memories. We offer a series of suggestions. Chapter 13, Accessing memories, secret letters, monologues and dialogues, visualizations. I think Chapter 13 alone is worth the price of admission. I work a lot off of childhood memories and even the event that happened two minutes ago comes back to me with a dreamlike quality when I sit to write. I have not thought of the things I do naturally as triggers, but indeed they are. It was quite interesting to see these natural aids laid-out and organized on the page to read: objects and place as starting points, physical sensation as triggers, people in memory, and predominant feelings. The section on secret letters – that is, letters that you write someone and never send – was particularly interesting. I’ve only done this twice in my life, but I know some folks who do it all the time. I’m sure it is a common practice and would make a fine jumping-off point for some. The authors go on to monologues and dialogues – now everyone does that in their heads – and visualization. Hey, if you can see it, you can write it. I’m an experienced writer and I enjoyed the book and the exercises and learned a few new things, got a few new ideas. If you are inexperienced or stuck midway in a transition from one form of writing to another, you’ll benefit from the exercises, ideas, and instruction in Writing Your Self: Transforming Personal Experience. This one’s a definite thumbs-up. Myra Schneider is a British poet, a poetry and writing tutor, and author of the acclaimed book: Writing My Way Through Cancer. Your can visit her HERE. John Killick was a teacher for 30 years, in further, adult and prison education, but has written all his life. His work includes both prose works and poetry. You can visit him HERE.